This week we’re working on Chase Me. I really need to build value in me on the agility & jumping field, and that means I’ve had to change the way I play with Jaxon from day to day. Jaxon has always been big on stealing a toy, and trying to get us to chase him. We taught him that, so it’s really our fault! Chase me is all about getting the value into me, and not the toy, the food etc. It’s a very simple & fun game which is secretly a training session. First thing is to choose a couple of high value tug toys for this game. You don’t want to use a ball, and it’s definitely not about rewarding with food. Take the first tug toy & hide the other in your pocket. Get your pup to start tugging on the toy, then release and give it to your pup. At this point, Jaxon normally runs off and wants me to chase him. Here’s where the training session kicks in. No matter what, you need to keep running away from your dog – using the limited space you probably have – to get them to chase you. The idea is that the dog will start to bring the toy to you & try to get you to interact with them. 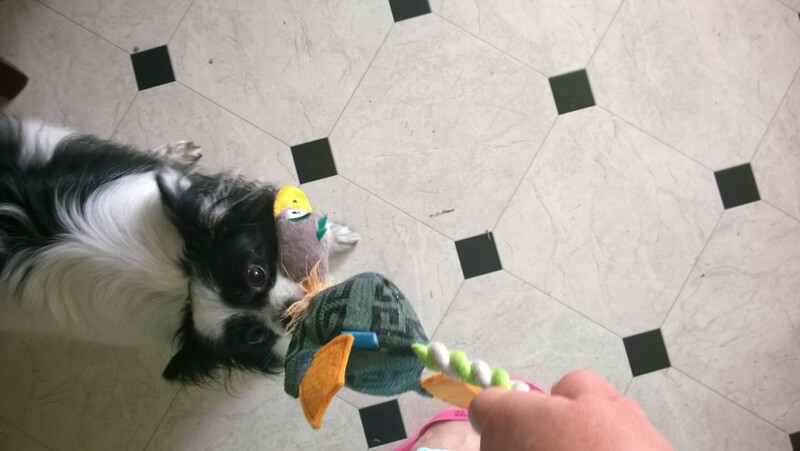 This is exactly the behaviour you want, so if they do – grab the toy & have a good tug with them. Use your marker word ‘Yes” and lots of high energy praise. For example – Good dog, Great work, You got it! Repeat the above if it’s working for you. End the session on a high. If your dog will chase you, but won’t come close enough to bring you the toy, this is where the second toy comes into play. Follow the same process, but as your pup comes closer, pull out the second toy. You really want to ignore the dog playing with the other toy, and focus on the toy in your hand. Have fun, shake it about, tap it on the ground – do what ever you can to get the dog to play with the toy in your hand. When they do – have a good tug with them. Again – use your marker word ‘Yes” and lots of high energy praise. For example – Good dog, Great work, You got it! It’s only a 5 minute game. Always end on a high. Play the game once a day over the space of a week & see how much you can build on the Chase Me game. Ultimately, your dog should be bringing the toy right back for a tug, and having a good game of chase with you – where you are the value. Not the toy, not you chasing them, not them giving up – just you! Keep going & have fun! Posted on February 5, 2014, in Fun, Training and tagged Dog, dog training, fun, papillon, puppy, puppy training. Bookmark the permalink. 2 Comments. Such a smart idea. Simple but makes sense. I am going to try it this weekend. Chowkski always runs away with the toy because he finds it fun.